As the Prohibition era began, so did the era of speakeasies, the dark alley, hidden-room gin joints, also known as “blind pigs” in their day. Liquor was concealed in trick cabinets, disguised in bottles with other labels, and often served in teacups in the event of a police raid. The term “speakeasy” came about because of the need to talk quietly, or “speak easy” about the location to avoid being heard by the general public or authorities. Speakeasies had various ways to keep the wrong people from entering their illegal lounges, ranging from secret passwords to special handshakes and secret knocks. Ironically, once saloons were forced to shut down, multiple speakeasies sprang up to compensate for every closed institution, and alcohol consumption only increased. Prohibition was the heyday for famous gangsters like Al “Scarface” Capone and Lucky Luciano, as they smuggled in shipments of moonshine, gin, whiskey, and other outlawed liquors to sell behind closed doors. When Prohibition ended, speakeasies were no longer necessary, and most simply became memories of a bygone era. 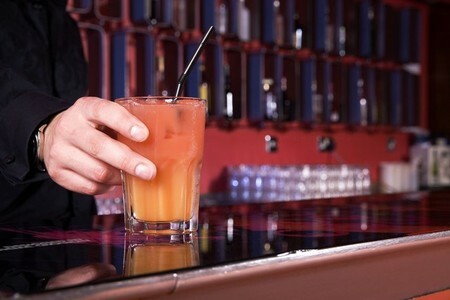 However, over the last decade a recent trend across the United States has emerged, with hidden bars opening up in the style of the old 1920’s speakeasies. San Diego itself has a variety of these hidden gems, where people can go to indulge in the mystique and edgy exclusiveness of little-known bars, purposely hidden from the public eye. Named after the “Noble Experiment” of Prohibition, this speakeasy is concealed inside a restaurant in the Gaslamp Quarter called Neighborhood, located at 777 G. Street. The Noble Experiment is the hardest of the San Diego speakeasies to find, since the hidden door is disguised as a wall of beer kegs close to the bathrooms. Simply push on the right side of the wall of beer kegs and you can enter the bar, with a red neon sign greeting you and a series of ornate brass skulls adorning the walls. Look around and you will notice the glowing chandelier, intricate paintings on the ceiling, white booths, and an overall Gothic style with dim red lighting to really set the mood of secrecy. The Noble Experiment is known for its excellent crew of mixologists, who can create a classy cocktail suited to your particular taste buds if you simply order the “Bartender’s Choice.” The bar pays homage to historical accuracy by only serving pre-Prohibition liquor, so don’t expect to find any vodka here. The average price for a cocktail is twelve dollars, but the bartenders take their time to produce only the best drinks, and they are definitely worth the price. You can check out The Noble Experiment online at www.nobleexperimentsd.com but, true to the spirit of speakeasies, their website is oddly secretive, showing only an email address, phone number, and a picture of a key with the letters “N” and “E.” The maximum capacity for the bar is thirty-five, and reservations are almost always required. To make a reservation, send a text to (619) 888-4713 at least a week in advance, especially for weekend nights. The Noble Experiment is open Tuesday through Sunday from 7:00p.m. until 2:00a.m. 1. No cell phones at the bar. 2. No parties larger than six. 3. Drink with an open mind. 4. No unsolicited advances on female patrons. 5. Dress code strictly enforced: Collared shirts for men, no sandals or athletic shoes, no shorts, and no ball caps. In the past, the doorman would only let you in if you were on the guest list, but just recently seating has changed to first-come, first-served. Prohibition is open Wednesday through Saturday from 7:00 p.m. to 2:00 a.m. and the bar is small and intimate, so make sure to get there early enough to get a seat. After entering, walk down the red hallway and red-carpeted stairs to the below-ground lounge. The lounge itself is bathed in red lighting, while cartoons from the ‘20’s play on flat-screen televisions, and live music starts promptly at 9:00 p.m. Wednesday is Tiki Night, Thursday features Soul, Friday is Jazz Night and Saturday is all about the Blues. Try an Old Morgue (bourbon, Lillet, Cointreau, absinthe, and lemon) or a Donkey Show (tequila, lime, hellfire bitters, and ginger beer), just two of countless possibilities. Cocktails here average around twelve dollars each. On the last Wednesday of every month, there is a “Weird-off” competition, where expert guest bartenders go head-to-head to make the most bizarre, yet delicious cocktail possible. A recent addition to the bar is the impressive Scotch Counter, serving over forty single malts in addition to beer and wine every Friday and Saturday night from 9:00 p.m. to 1:00 a.m. The extensive Scotch collection showcases premium selections like the Bunnahabhain twelve year, the Lagavulin sixteen year, and the Aberlour eighteen year, just to name a few. For more details, check out Prohibition online at www.prohibitionsd.com. 3. If you want to approach a lady, you should do so with a drink. 4. Booths are for communal seating, please invite guests. 5. If you want a fancy cocktail, it’s going to take a minute, so please be patient. Like The Noble Experiment, the Gaslamp Speakeasy is known for its excellent bartenders. There is an extensive list of wines, beers, and cocktails, and the Whiskey Sour comes highly recommended, as they use real egg whites in the concoction. Other favorites include the Bramble (Bombay Sapphire, muddled blackberries, crème de cassis, blue agave nectar, and fresh lime), and the Corpse Reviver #2 (Bombay Gin, Cointreau, Lillet, fresh lemon, and soda). For groups of eight or more, bottle service is available for only fifty dollars, featuring 42 Below Vodka. Unlike the first two speakeasies, this one actually offers a variety of bar food, such as the Smoked Sausage & Onion Marmalade Flat Bread and the Grilled Hanger Steak Skewers, in addition to the plethora of alcohol. Come by any night of the week to experience a blast from the past at the Gaslamp Speakeasy in Downtown San Diego, and feel free to check out the menus online at www.gaslampspeakeasy.com. So whether you are a local or just visiting the area, seek out these elite bars to indulge in fabulous cocktails, a sultry ambiance, and period music. Experience the thrill of hunting down the camouflaged locations, and revel in the knowledge that you are one of the few to experience the hidden side of San Diego. Of course, this list is not all-inclusive, so you just might happen to stumble upon your own secret enclave. In this Southern California paradise, the nights are long and the possibilities endless.